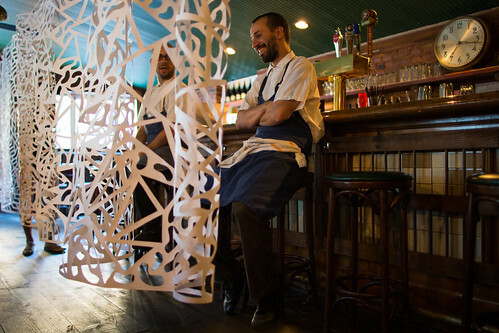 Chefs Jose Ramirez-Ruiz (of the Tuesday Night pop up dinner, Chez Jose) and Gabriel Moya (Calyer Brooklyn ) share many similarities, both are talented chefs born in Puerto Rico, both have been a part of some of nyc’s best kitchens. (Jose: Per se, Isa, Gabriel: The Modern) and both just so happen to be cooking food that bares little to no resemblance to food they grew up with. What would it be like if they were to professionally cook with flavors and inspiration from their homeland…? I’ll tell you what happens, a spike in puerto rican tourism! What an amazing 11 course meal! 01.Chicharron delicious as always!! 02. Fried plantain flavored with red-pepper aioli Great crunch spicy salty combination. 03.Salt-cod fritter with a salt-cod whipped topping This dish was incredible. Salty and creamy! 04.Root vegetable salad – yuca, taro, and a panoply of other tubers and roots draped with purslane. A fantastic bite full of crunch and salty flavors of the sea! Pam Yung never ceases to amaze me! Every dessert she concocts and artfully lays out challenges even the most experienced gastronome. (I mean this in a best way possible) She pushes her diners with unexpected reinterpretations of some of the most typical desserts, like Rice Pudding. I think she needs her own Dessert shop asap! !